For the past five years, FAR’s Anush Mathevosian Scholarship Program has enabled Hovhannes Mkrtchyan to attend college. A student at the Armenian State University of Economics Gyumri branch, Hovhannes wants to become a loan officer. His experience of being supported by FAR has also inspired in him a love of volunteering. 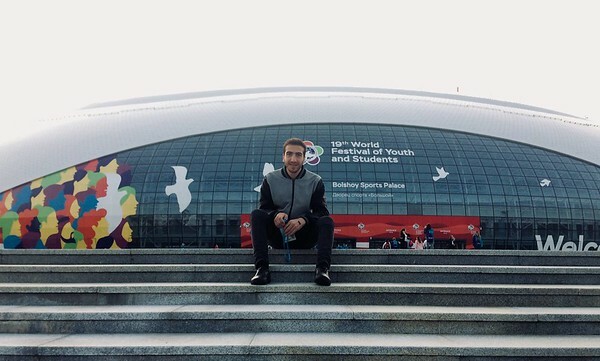 In October, he was the only Armenian to participate in the 19th World Festival of Youth and Students, held in Sochi, Russia. The festival brought together young people from 180 countries to participate in this great event, where they exchanged their knowledge and skills in the fields of politics, economy, and culture, etc. Hovhannes, 21, is thrilled to have had the chance to create a huge network of peers and mentors who share their skills and expertise. “It was a great responsibility to work in line with the other volunteers coming from Serbia, Russia, and Germany. As an attaché, I accompanied a group of 20 artists,” he said. For Hovhannes, volunteering is a means to help those in need while also enhancing his own capacity. He often volunteers for FAR, and recently joined a group of other FAR students who helped to clean the Gyumri Atinizyan Senior Center. “FAR has helped me, and I must help others,” he said, smiling. Currently, 105 students are supported by FAR’s Anush Mathevosian Scholarship Program.